A simple device without complicated mechanisms or motors. It allows the paring of leather to become a simple routine. Edge-paring and corners are a 'breeze' to undertake and as it is also so precise, preparing onlays and inlays become easy tasks. It can also cope with handling large areas of leather. The machine is provided with 3 roller-cylinders of different widths - 4, 8 and 12mm to make it capable of paring even narrow pieces. 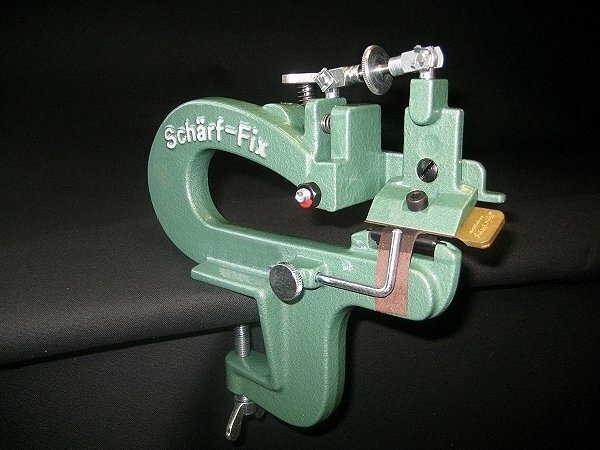 The patented mechanism of the Scharf-Fix 2000 automatically makes the knife stay in the chosen position, so there is no need for time consuming readjustments. 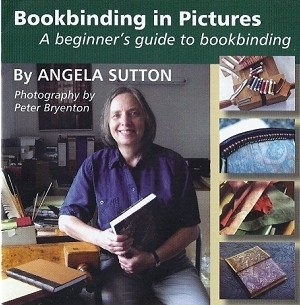 Bookbinding in Pictures is a working guide to the processes used in bookbinding. It is illustrated with over 500 photographs showing step-by-step the methods, equipment and materials used in rebinding and repairing books. Complete beginners will be able to acquire the basic knowledge needed to use more advance manuals without having to attend a class. Prospective book artists will see how a book should be constructed if it is to function properly as a basis for their future work. The work is published on a CD ROM and is designed to be read on screen, with the pages scrolling straight down and with the pictures beside the text. Readers who prefer a paper copy can print out whichever pages are relevant, using a home printer.